In addition, the 400,000-plus units sold in 2018 are a testament to the popularity and excellent consumer reviews of this nicely designed SUV. Unlike most current SUV models, the CR-V doesn't offer many stand-alone options, and the reason is simple. Each of the available trims is quite appealing in terms of the standard features, and buyers will have no trouble finding the trim that suits their taste and needs. Along with the above mentioned features, the base LX comes with 17-inch alloy wheels, cruise control, a height-adjustable driver's seat, and a four-speaker sound system. Also included are two USB ports and a 5-inch color display. Other notable features on the EX include 18-inch wheels, fog lights and heated mirrors. 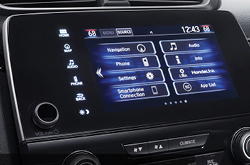 The driver information display and 7-inch screen display are of very high quality as well. The EX and higher trims also feature smartphone app integration, satellite radio and an upgraded rearview camera, while the EX-L and Touring trims come with a programmable-height power liftgate, auto-dimming rearview mirror, power-adjustable front passenger seat, and eight-speaker sound system with HD radio. The CR-V receives a few changes this year, including a new Platinum White Pearl paint color that replaces White Diamond Pearl. Its trim levels have also been revised. The EX-L with navigation has been dropped now that the EX model and above all come standard with a Display Audio system that includes Apple CarPlay and Android Auto, which offer navigation apps like Google Maps and Waze. The Honda CR-V is not only one of the top-selling compact SUVs for sale in Phoenix--it's one of the best-selling vehicles in its class nationwide. In addition to its many features, it stands out for offering an available turbocharged engine, available all-wheel drive, superior cargo space among its competitors and strong resale value. 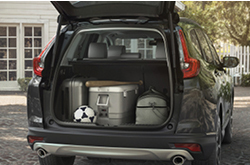 Visit Bell Honda to find the Honda CR-V for sale near you and take it for a test drive. How Does the 2019 CR-V Perform? The base trim is fitted with a 2.4L four-cylinder engine rated at 184 horsepower. All-wheel drive is optional on this and all other trims. The transmission is continuously variable across the trim lineup. The EX and above trims get a more powerful, turbocharged four-cylinder that puts out a total of 190 horsepower. Ride quality is excellent, and the CR-V cruises noiselessly at freeway speeds. The suspension system is tops in its class, with virtually no shocks felt by passengers when the vehicle travels over bumps in the road. Even though the engine is pint-sized compared to the V6s in the larger SUV models, the CR-V really offers more than acceptable acceleration, especially with the turbocharged engine. It takes only a little more than seven seconds to go from a full stop to 60 mph. 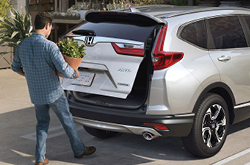 Some shoppers balk at the idea of purchasing a vehicle with a CVT instead of a traditional automatic transmission, but the Honda CR-V boasts one of the smoothest-shifting CVTs available, with the initial acceleration from a full stop a very seamless operation. The 2019 CR-V comes with a full set of airbags, a rearview camera, the LATCH system of child seat anchors and tethers, stability and traction control, and antilock brakes. 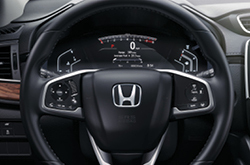 All but the base LX model include a full suite of safety aids including automatic high beams, blind-spot monitoring, rear cross-traffic alert, lane keeping assist, adaptive cruise control, and forward collision warning with automatic emergency braking. That's quite a package, something that many competing models don't offer as standard except on the top trim level. As stated earlier, buyers don't have to purchase a package or order a stand-alone option to get all of the driver aids on the CR-V. All in all, it's a very safe small SUV that should provide lower insurance premiums than many of its competitors. 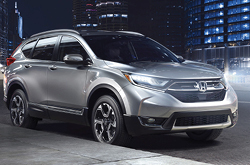 *$6 a day lease offer based on 2019 CR-V LX 2WD $159/mo: All offers plus tax, title and license. Payments based on factory equipped cars. Inventory current at time of media release. Over 5 available for each model. 36-month lease with $2,990 due at signing, plus first month payment and $0 security deposit. On approved credit. An extra charge may be imposed at the end of the lease term. 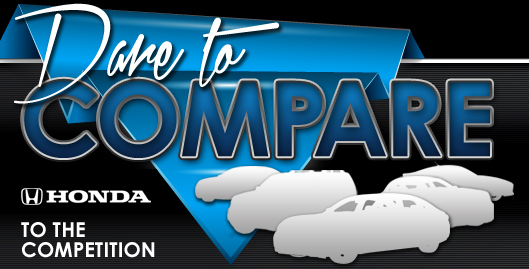 See Bell Honda for details. 2018 Best Buy Award: For more information, visit Kelley Blue Book's KBB.com. Kelley Blue Book is a registered trademark of Kelley Blue Book Co., Inc. Purchase prices do not include tax, title, license and $499.00 doc fee. Prices include the listed Factory Offers and Incentives. Please verify all information. We are not responsible for typographical, technical, or misprint errors. Inventory is subject to prior sale. Contact us via phone or email for more details. MPG Based on 2019 EPA mileage ratings. Use for comparison purposes only. Your mileage will vary depending on driving conditions, how you drive and maintain your vehicle, battery-pack age/condition, and other factors.